Noah is working to get the herd to bed for the night, and what a feat to attempt! Told in rhyme, this story is too cute! The animals are their mischievous selves and certainly don't make the routine easy for poor Noah. He calls them to find their buddy on the ark, and get tucked in before the rain starts. Noah falls asleep easily, but not the animals. Like little kids afraid of the storm, the animals come into Noah's room to find comfort. The thunder and lightening brings the animals in two by two to snuggle in with poor Noah. His bed certainly can't hold the elephants coming in. Once everyone is in Noah's room the ark starts to tip from the lopsided-ness. The tipping is the first that wakes Noah.. wow what a sound sleeper. Noah ends up singing them a night time song and lulls them all to sleep. 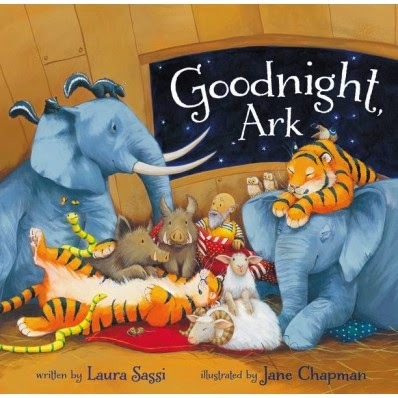 The illustrations are so comical as the animals all pile into bed with Noah. Beautiful colors, bright and attractive for the listener. This book is perfect for little ones as it is short and told in rhyme. Pick up your copy today from Zondervan! I love the idea of adding a bit of humor to it. Kids love Noah's ark story anyway and adding this makes it so much more fun to read.